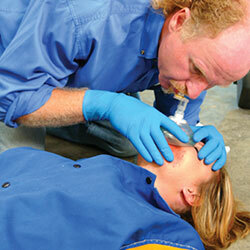 The Emergency First Response courses offer a flexible delivery method to meet your individual requirements. Participants master required skills and knowledge through a combination of independent study, instructor-led skill development and scenario practice sessions. 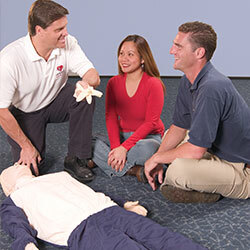 Instructors can also add relevant information to meet specific workplace or local training requirements. Independent study accommodates individual learning styles and allows participants to learn at their own pace. This leads to better preparation before skill development, particularly when participants watch the video and see role-model skill demonstrations. Participants arrive prepared for hands-on training, which makes in-class time shorter to accommodate busy schedules. Independent study allows the instructor to focus on skill development and scenario practice during face-to-face time with participants. Since independent study reduces the amount of time an instructor must spend covering general background knowledge, more time can be spent on skill development to meet specific workplace requirements. The face-to-face time is focused to fill in any knowledge gaps and to provide information relevant to local regulations. 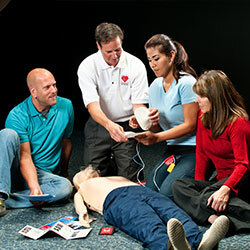 Though Emergency First Response courses and materials lend themselves well to independent study and the classroom time savings benefits this brings, there are other teaching formats your instructor may use. In some cases, live delivery of the theory components (as well as the practical sessions) is preferable. You and your instructor will determine which method is best for you. 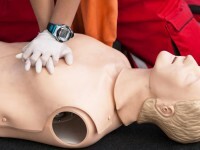 The content of the course will cover how to deal with the Role of the first aider, Head injuries, Managing an emergency, Health and safety (first aid) regulations, Communication and casualty care, Low blood sugar, Asthma, Poisoning, Bleeding (minor and severe), Resuscitation (adult CPR), Bone - muscle and joint injuries, Seizures (adult), Burns and scalds, Severe allergic reaction, Chest pains (including heart attack), Shock, Choking (adult), Spinal injuries, Eye injuries, Stroke, Fainting, Unresponsive casualty. Successful candidates receive the EFR First Aid at Work Certification, recognised by the UK Health and Safety Executive and is valid for three years. There are no minimum participant numbers for this course. 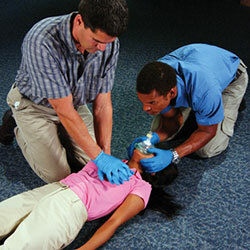 EFR Primary Care (CPR) teaches participants how to respond to life-threatening emergencies. The course focuses on primary care through a combination of knowledge development, skill development and realistic scenario practice to make sure participants have the confidence in their ability to provide care when emergency situations arise. There are no prerequisites, age restrictions or water sessions required for this course it’s open to everyone. Scuba divers, snorkelers and anyone who is around divers, boat crew, lifeguards, etc. will benefit from having this training. 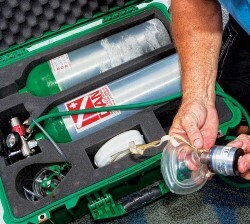 We have emergency oxygen units available to use for training can help you purchase your own unit, if required, for use after the class. You’ll also need to have a disposable non-rebreather mask to use during practice sessions which we will provide. 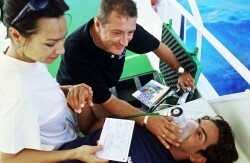 Successful candidates receive the PADI Emergency Oxygen Care Certification.